iPhone, iPad, Mac & Me: RhinoBall - Free Movie Tie-In Game! RhinoBall - Free Movie Tie-In Game! If you have read my blog before, you probably know that I like iPhone apps that have movie tie-ins. Some have been more successful than others. I saw "RhinoBall" [iTunes link] a few weeks ago and I bypassed it because it was free and I didn't know it had anything to do with a movie. 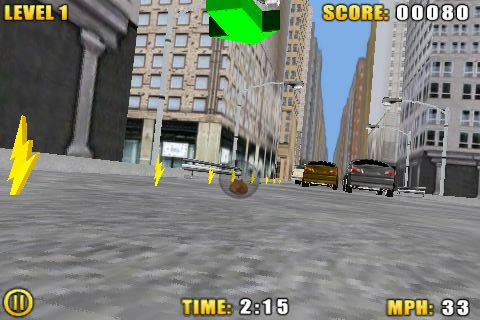 But, today I found it again and this 3D hamster-in-a-ball racing game is based on the upcoming Disney animated film "Bolt" that's coming out this Friday. You have to guide our hamster Rhino to the finish line and at the same time gather these mini-bolts. The graphics are great considering it is a free game. However, the accelerometer controls leave a lot to be desired. I suppose if the controls were spot on then it would be too easy of a game. Before you get to a ramp, make sure you build up enough speed to get some "hamster air." There are movie cut-scenes in between the levels. The app also comes with the movie trailer and a TV ad. This is a quality free game. I knew a company like Disney, with a lot of money, could put out a quality game app for free. Kudos also to AvatarLabs who actually did the grunt work to develop the game. Download it. Now.